A man has died after a fire broke out on the A1 in North Yorkshire following a crash involving two lorries. A car transporter and a refrigerated lorry crashed on the northbound carriageway between junction 50 and 51 near Baldersby just after 07:00 BST. The driver of the refrigerated lorry was pronounced dead at the scene, North Yorkshire Police said. The northbound carriageway is expected to be closed for most of the day and diversions are in place, police said. 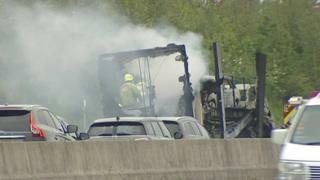 Both lorries were on fire in a "significant incident" but have been extinguished, the fire service said. Police, fire service and ambulance crews have been at the scene, between junction 50 for the A61 and Junction 51 Leeming Bar. A diversion is in place at junction 49 and Highways England recommends traffic for the north east should use the A168/A19. Drivers stuck directly behind the incident are being turned back, said Highways England, meaning the road is closed currently at junction 49. Stuck drivers are being advised to stay with their vehicles and not to move unless told to do so by officers.